Lynx - thank you. I'm really looking forward to sharing the story with more people. Just now only my flatmates and boyfriend have the pleasure of listening to me ramble on about what is happening next. Clairey - she is indeed! We've got our fingers crossed that Tahini will be okay with sharing Foster with a little girl where Gracie was unacceptable. I'm sure she'll keep everyone informed on how Lefty gets on. I'm sure Tahini can't see a tiny little bundle like Lefty as a threat. 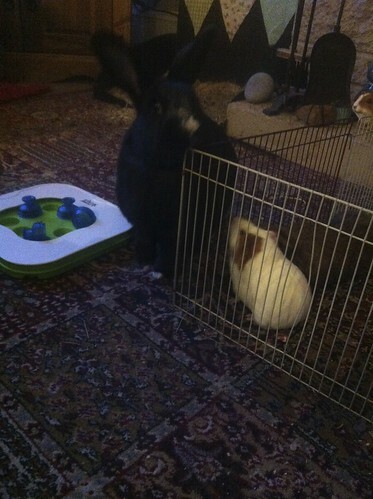 How cool that your 2 ex foster-pigs are (hopefully) going to end up together. Just catching up . . . I love the family photo pics! 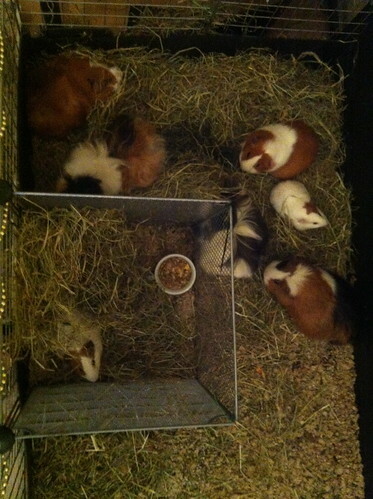 What *well behaved* piggies! The trip to Thistle sounded wonderful and that scenery is beautiful. Love your tree too! clairey I did think that it was pretty cool that two pigs who I've cared for may live together. Mildred - the trip to Thistle was lovely! I absolutely loved looking after her chickens, they are hilarious when they run! Maisey (formerly Runt and Maple, Maple just didn't stick) heard that today would be Introduction Day. Introduction? What on earth was this? She decided the safest approach to "Introductions" while her mummy was in hospital was to be absent. 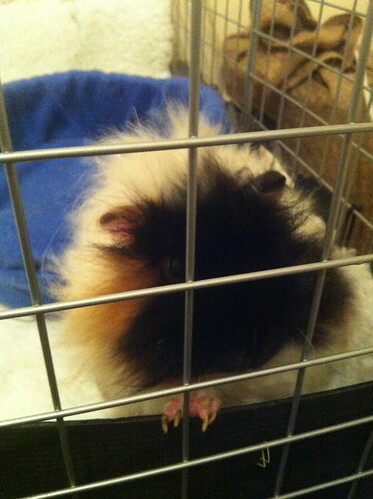 A ramp appeared in the cage. A frightening new thing covered in strange smelling things and... and... oh, a ramp must be a different kind of veggie plate. Unfortunately the guinea pigs were powerless to do anything about this reconstruction as they were too busy trying to work out who these other pigs were! 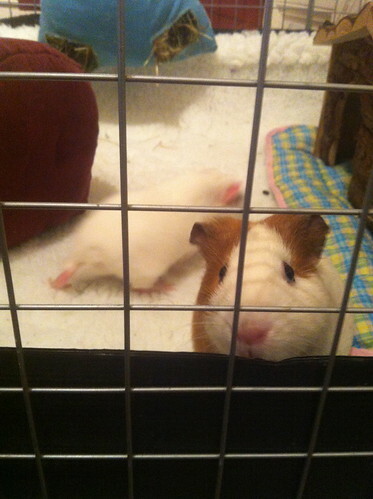 Who on Earth is THAT sneaking into the girls cage? How did he get there? Does he have a hall pass? After a few journeys southward Buddy decided that he would rather guard the hay rack. 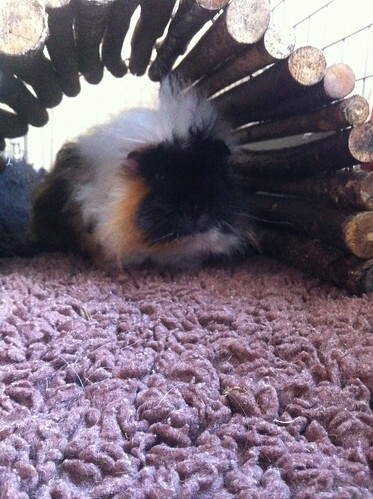 Buddy was recently very, very unwell following the removal of an abscess on his throat. Just before he started eating himself he began to lose the fur on his stomach and bottom so he looks like half-a-skinny. Thankfully his fur is now growing back! The concept of having two cages is still quite new. Both genders have retreated to the safety of their old cage; boys gravitating northward and the girls lurking to the south. I'm not planning on pushing them to interact with each other as I'm sure they'll merge and split as they want. 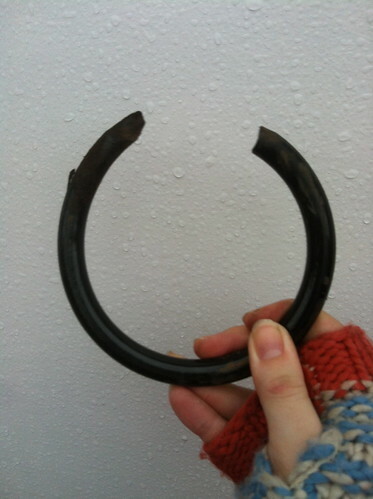 If you haven't read Meribel's medical thread: Meri had an accident jumping out of the hay rack and has broken her leg. She'll be in confined quarters for the next four weeks. Lovely to see all the pigs and loved the photo of all of them in the kitchen area. Best wishes for Meribel's recovery. Had read about her in the medical thread and hope her leg heals quickly. 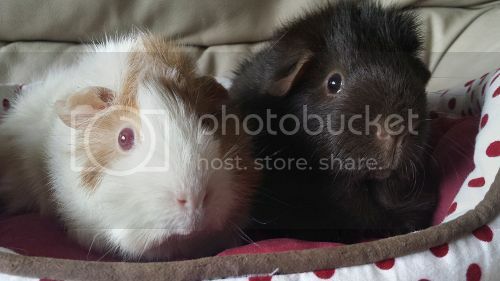 I was expecting the little pigs to be small from the photos but seeing how tiny they were was still a big shock - I think even Rosie and Gracie must have been a bit older when we got them. Of course we have Foster and Tahini now, who are a funny middle-aged couple living in a 3x5 C&C (we never downsized as they loved it so much). 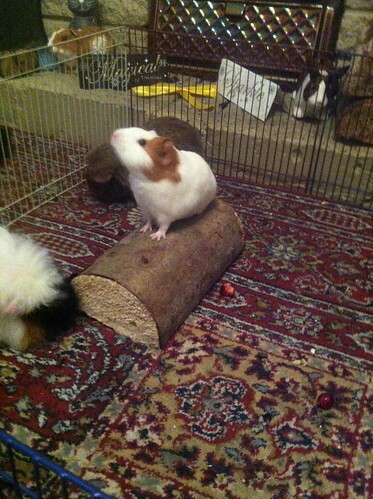 Foster is of the opinion that he is in charge but Tahini rules the roost - she is wicked smart while Foster is, bless him, the least intelligent guinea pig I have ever met but such a mild mannered and polite squishy boy. He is not allowed to mount Tahini for example, yet she mounts him when in heat. 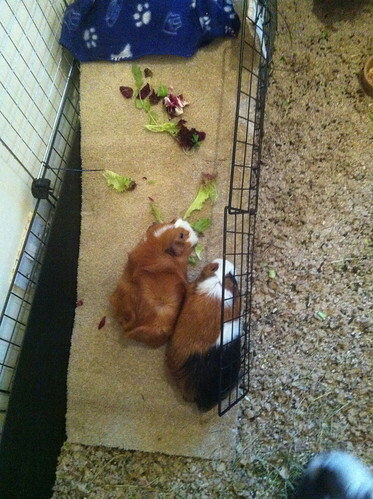 But when either hears the veggies getting chopped, they run and wake the other up. 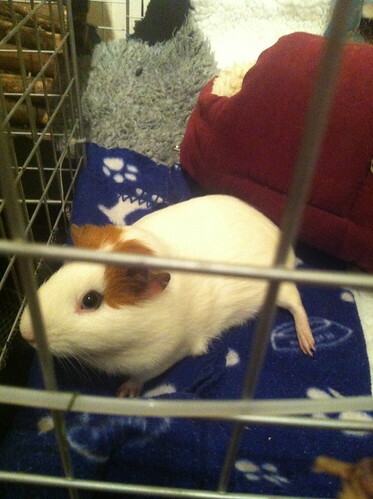 Tahini has tons more energy that Mr sleepy Foster so I hoped that Daisy would give Tahini a playmate so that Foster is bothered less - and equally that a snuggly pig would suit Foster well. I was actually expecting Foster to be won over immediately while Tahini might be troublesome... but that's not how it turned out! 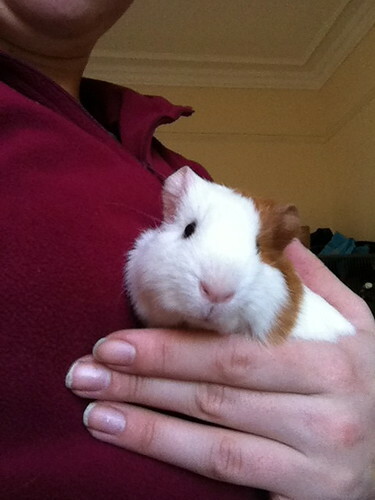 Back at home, little Daisy went straight into introductions with the big pigs. She was super excited, popcorning like crazy while Tahini chased her about - and if Tahini lost interest, Daisy ran over and got her excited again. Foster meanwhile was utterly confused, and when Daisy attempted to get milk from him he ran away in sheer horror. Such a massive pig going flying backwards in the face of a tiny wee girlie pig was terribly amusing! Little video of introductions here! Tahini and Daisy were having great fun and when Foster eventually tried to join in the chase he accidentally tried to mount Tahini instead of Daisy and got roundly told off. Tahini was also quick to tell him off if he chased Daisy - I guess she thought he was too big and rough! And interestingly, Daisy has scored the big house to herself when she wants it. She's not worried by the other two at all - if she's had enough play she tells them and they accept it. 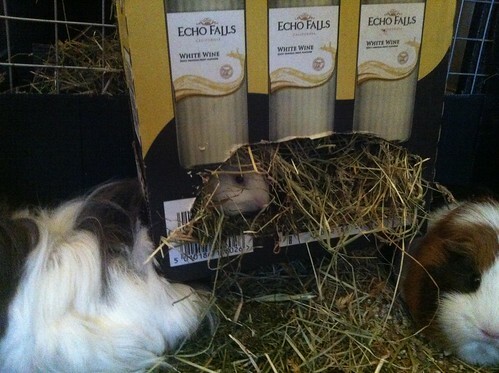 But if she wants a house, pigloo or water bottle she gets her own way! 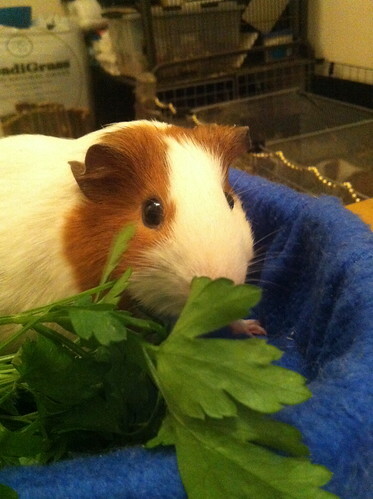 Best of all, Tahini is now occasionally forgetting she's supposed to be a skittish pig. Probably because she's so knackered! We watched a Harry Potter film last night and Daisy came out to watch - it's the first time she's snuggled down on me properly (rather than trying to climb up me) and she stayed out for ages quite content in my lap. 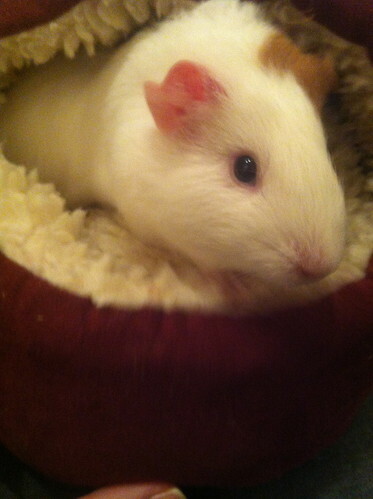 I've not had a tv watching piggie since Rosie (and Frisky). So Cute! Nice to see you again Trick. 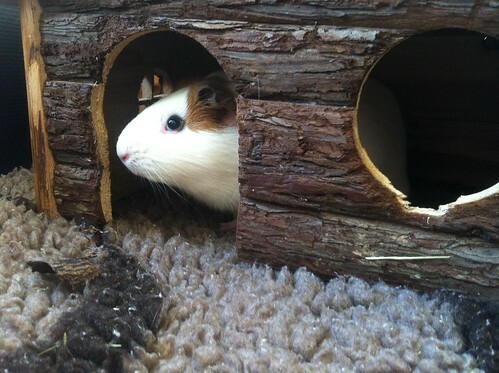 You know Gracie was one of my favorite piggies of all time. Last edited by NoCableisSafe on Tue Dec 24, 2013 6:45 pm, edited 1 time in total. 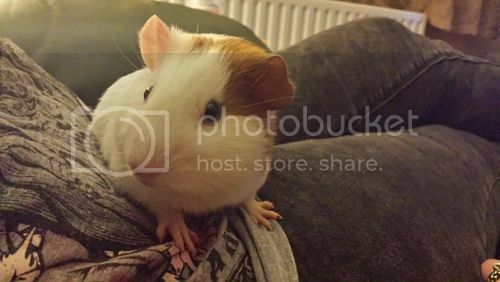 Thank you for posting the update about wee Daisy, Trick! 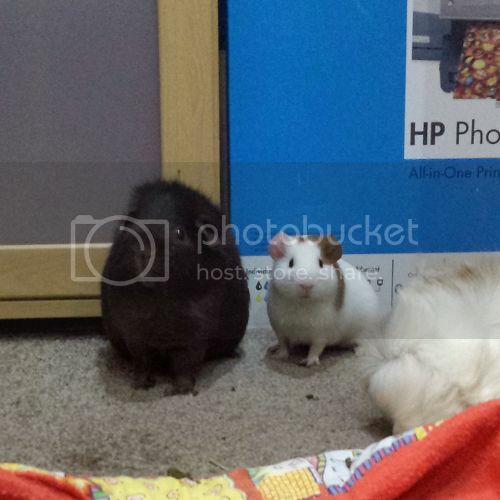 My gosh, the three of them, Tahini, Foster and Daisy are so adorable! I love Daisy :) Actually, I love them all! It was quite sad to see both Chomsky (Cow) and Daisy go to their new homes, but I have been receiving enough updates and invites to come over for tea from their new owners to keep me happy. 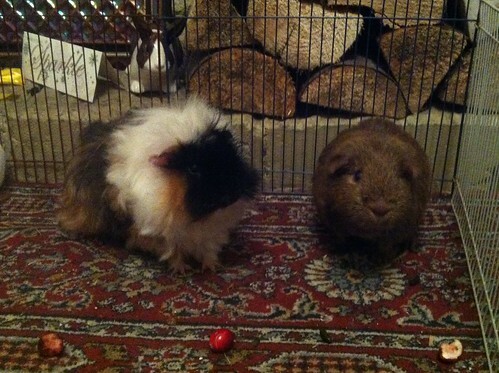 Both pigs have successfully become the little prince or princess of the cage they were introduced too! As! It's so lovely to know they have such wonderful homes! "Listen Up Ladies and Gentlemen, I have something to say!" "You too, Mr Two Toes, I want your full attention please." 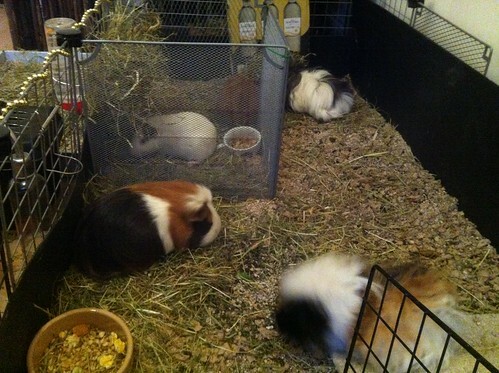 "A while ago we piggies were given grass collected from the big-ones parents garden. 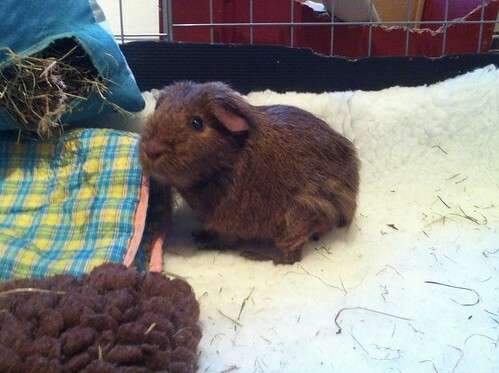 It was my first taste of grass and since then there has been an ABSENCE of grass!!!!" "I have looked everywhere! I have searched inside the big cuddle boot." "Just the other day the big-one taunted us over to the cage and I decided she was promising grass but she only had CUCUMBER! YUCK!" 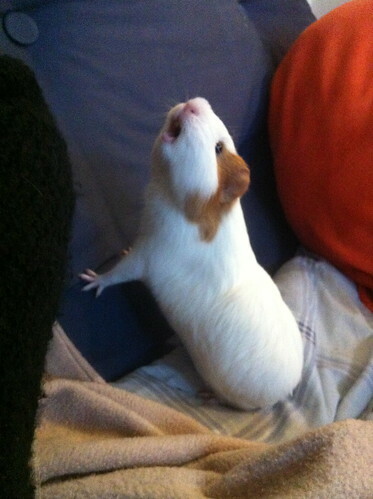 "Can ANYPIG, SHARP-TOOTH OR HUMAN HALP?!" "This is a Priority 1, Severity 1 EMERGENCY!" 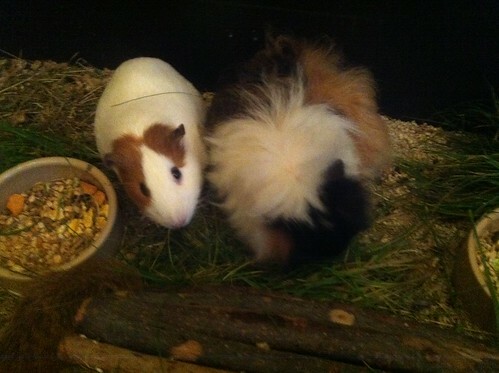 I almost, ALMOST got a brilliant picture of Scribble and Buddy in the living room enjoying some Christmas Cranberries. Meribel has continued to heal her broken leg, and I have continued to cross my fingers and toes that it will heal and stop causing her so much pain. 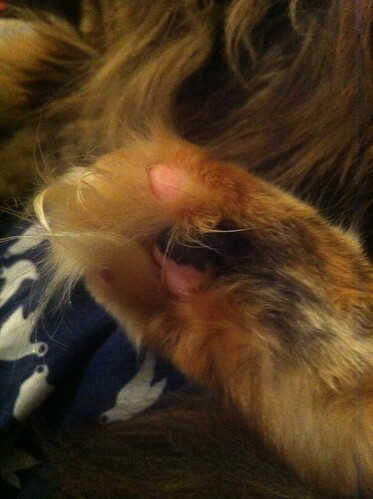 I struck a deal with the cat that if I fed her she would let me coo over her bean-toes. 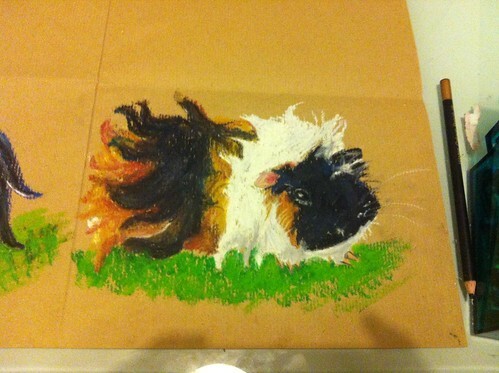 I began to draw each of the pigs in the cage so we can hang up their portraits. Maisie was cute and continues to grow. but I got a souvenir. I also got a promotion at work. WEEEEE!